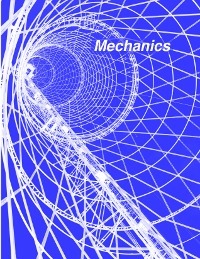 This is a calculus-based book meant for the first semester of the type of freshman survey course taken by engineering and physical science majors. A treatment of relativity is interspersed with the Newtonian mechanics, in optional sections. The book is designed so that it can be used as a drop-in replacement for the corresponding part of Simple Nature, for instructors who prefer a traditional order of topics. Simple Nature does energy before force, while Mechanics does force before energy. Simple Nature has its treatment of relativity all in a single chapter, rather than in parallel with the development of Newtonian mechanics.